This Laughing Buddha on Dragon's chair signifies victory and capturing the throne. It promises power, authority and influence. Placed at ones personal sheng chi direction, it promises winning and triumphing over any competition one faces. This is another beautifully designed Red Robe Laughing Buddha with excellent finishing. Wearing the Red Robe, He overcomes sadness, obstacles and provide you with a smoothride and happiness throughout the year as opposed to sorrowness. 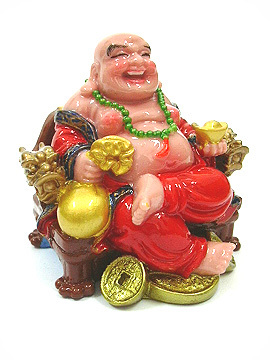 This Laughing Buddha brings happiness, riches and wealth signified by the wealth bag and gold ingot that He carries. 4. Bosses and politicians can place him in the north of their offices or home for protection against unwanted unhappiness/stress and attract tremendous good luck. 7. Place him in the north direction on your office table to take away all stress and bad politics or backstabbing. He will speed your way towards achieving your happy goals.